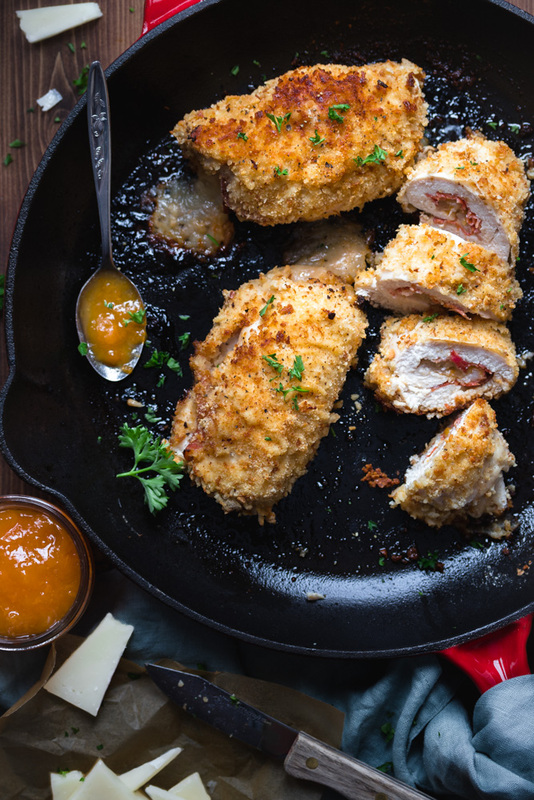 We’re cooking this Spanish Apricot Chicken Cordon Blue with Sherry Cream Sauce for our loved ones this February. And then we’re gonna continue to cook it indefinitely, because it’s just that good! This is a meal that is perfect for guests or maybe a special someone you want to impress. Here, the classic dish gets a Spanish spin to it with the use of Iberico reserva cheese and Serrano ham in the filling, along with a Spanish sherry wine in the cream sauce. The filling also has a non traditional addition of apricot jam. The sweetness of the jam pairs so well with the nutty cheese. Honestly, this is pure decadence. This dish is a real winner and we are so excited about it! Plus it’s not hard to create, despite the lengthy looking instructions. We wanted to be very precise and we do have a few tips for success every time. We used sourdough for the breadcrumbs because they impart a lovely, tangy flavour. To get a more evenly browned surface on the chicken, we toasted them in the oven first. You can of course use panko bread crumbs, but you will loose some of the flavour the sourdough provides. Then, before dredging in the coating, we recommend placing the stuffed chicken in the freezer for about half an hour. This helps prevent it from unrolling when applying the coating. Finally, the dish can be either baked or pan seared in a cast iron pan and then finished in the oven. 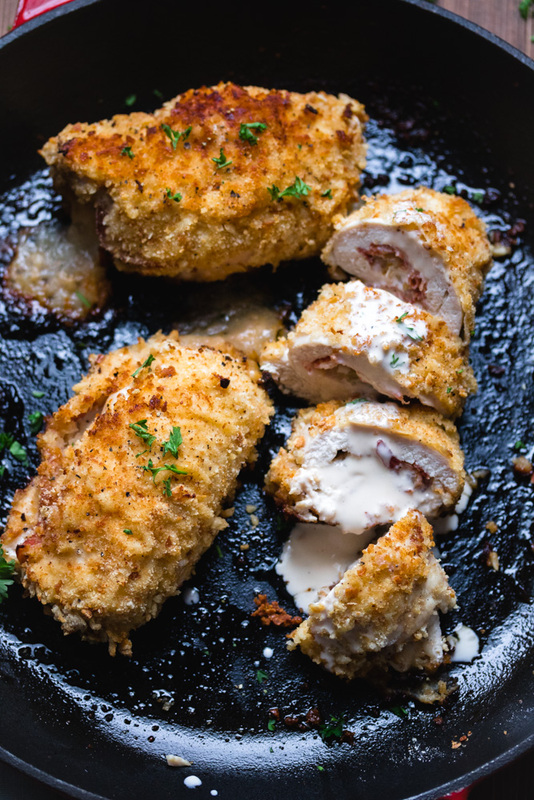 We recommend the second method for a crunchier crust and more appealing looking chicken. But hey, looks aren’t everything. If you haven’t had Iberico Reserva cheese before, it’s a mix of sheep, goat and cow’s milk. The resulting cheese is somewhat nutty, with a unique blend of flavours imparted by each different milk. It’s seriously delicious, but we have also used manchego cheese, a sheep’s milk cheese from Spain, and it’s just as good. A Spanish spin on the classic chicken dish that boasts a sweet, savoury filling and is topped with a luxious sherry cream sauce. Preheat the oven to 375F. On a large baking sheet, spread out your breadcrumbs and place in the oven to toast for 15-20 minutes, stirring occasionally until golden in colour. Remove and allow to cool. After you’ve flattened the chicken breast, place a slice of serrano or proscuitto ham along the longest portion of the chicken. Starting at the widest end, add 2 tsp of jam and 2 ounces of cheese. Roll up the breast and place seam side down on a plate. Repeat with remaining chicken breasts, then place in the freezer for 30 minutes. While the chicken is in the freezer, lay out your dredging area. Place the flour, egg and breadcrumbs in separate shallow dishes (we use pie plates). Add salt and pepper to the breadcrumbs and stir together. 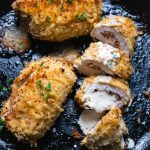 Remove the chicken from the freezer and roll each breast individually in the flour, followed by the egg and finally the breadcrumbs, pressing them to adhere to the meat. Preheat a cast iron pan over medium heat with 2 tbsp of oil. Once hot, add the chicken breast, seam side down and cook for 1-2 minutes, until the bread crumbs start to colour. Flip the chicken and sear the other side for 1-2 minutes more, adding more oil if necessary. Flip once more (seam side down) and place the pan in the preheated oven. 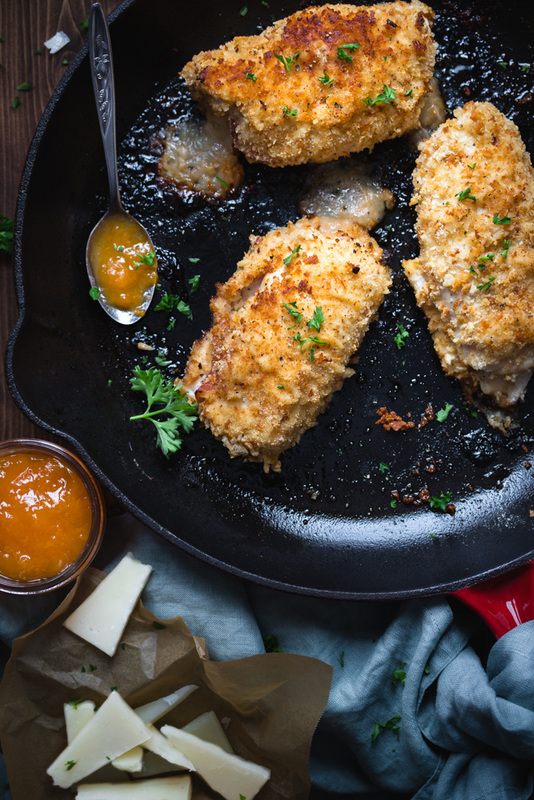 Cook for 20-25 minutes until chicken is cooked through, or until an instant read thermometer reaches 165F when inserted into the thickest portion of the breast. Alternatively, you can just bake the chicken and not sear it at all for 25-30 minutes. Be sure to spray the tops of the chicken breasts with oil before baking. Serve with the sherry cream sauce. Add the sherry to a pot and place over medium heat. Reduce until you have 1/8th of a cup liquid left, then add the cream to the pot, season with salt and pepper, whisk together and remove from heat.